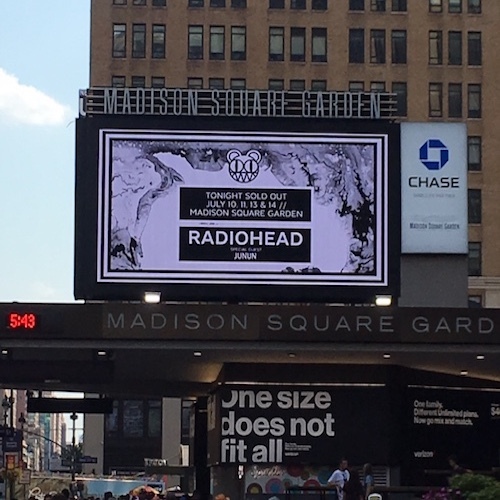 Saturday, July 14th, marked the forth and final sold out show for Radiohead at Madison Square Garden this week. Each evening a little more unique than the previous. One never knows what oldie or rarity the band might unearth on any given night. Already in Chicago during the tour’s first stop, “Blow Out”, was performed for the first time since 2008. A real treat for those in the audience as Pablo Honey era songs outside “Creep” are rarely attempted. Could we be so lucky at MSG night 4? The band came out of the gate like a slow lumbering beast, the gentle piano and keyboards of “Daydreaming” swirling and swelling to a crescendo of Thom Yorke pledging he is “Just happy to serve………you.”. Radiohead quickly flipped the script after the Neil Young tinged “Desert Island Disk” by transforming the entire arena into a giant pulsating rave party with “Ful Stop”. That is one of the many aspects I love about this band. The diversity in style and scope between one song to the next. They keep you on your toes at all times. A sensory overload for sure. Highlights from the main set included a slower version of “Kid A” with drummer Phil Selway supplying a military like backbeat, the punky “2+2 = 5” with Thom spitting out pure venom, “Videotape” with a new backing keyboard by Jonny Greenwood, the rejected James Bond theme “Spectre”, the Romeo & Juliet inspired “Exit Music (For A Film)” featuring fantastic guitar noodling by Jonny and finally the Can infused “There There”. Each time I hear it live I become more and more convinced that this tune is one of their greatest masterpieces. The guitar solo finale by Jonny was absolutely savage. He was playing like a man with his hair on fire. One of my favorite moments of any Radiohead show I’ve ever attended. A song like this is very very hard to top, so naturally Radiohead one upped it by playing “Street Spirit (Fade Out)” which is an all-timer in its own right. For me the encores at a Radiohead show are like unwrapping presents on Christmas Morning. What will the band give us tonight? What jaw dropping relic from the past or unreleased ditty could the band pull from their deep catalogue? At first it seemed the band were going to play it straight and simple with some old faithfuls like the always incredible “Idioteque”, the Ice Storm themed “House of Cards”, the sad guitar finger plucking of “Present Tense” and the rip roaring “Bodysnatchers”. However, the real gift in the first encore was the addition of “The Tourist”. It has only been played sparingly since the year 2000 but it seems the band have fallen back in love with the song as it has popped up several times since 2017. Encore 2 began with just Thom acoustically and Jonny on his laptop working on vocal loops as the duo launched into the somber “Give Up The Ghost”. I was surprised the band next performed “Optimistic”. One of the finer moments from Kid A but to me it deserves placement earlier in the main setlist. Doesn’t really have the feel of encore type song. I’d have looked towards “My Iron Lung”, “Let Down” or “Reckoner” but that’s just me. With one song left to play on the night, you knew it was either going to be “Karma Police” or “Creep”. Maybe even both like the last time I caught Radiohead at the Garden in 2016. The band elected for “Karma Police” and it quickly became the biggest singalong moment of the evening. I love that when the song finishes Thom keeps strumming and lets the arena sing the chorus as the band slowly slips off stage one by one. There have been a lot of whispers over the last few weeks that director Paul Thomas Anderson and Radiohead are secretly working on a tour documentary of this North American summer tour. I really hope that comes to fruition. It would be nice to see a spiritual successor to their previous documentary Meeting People Is Easy (1998). That film showed the pain and agony of becoming one of the worlds biggest rock bands. It would now be nice to cap it off with a celebration of all that Radiohead have accomplished over the last 25 years. It has truly been an extraordinary run, a run which hopefully has many more chapters yet to be written. Next Madison Square Garden and the Infinite setlist….